Two exhibits, one portraying a small slice of life, places to visit, and some of the people who live in St. Mary’s County and the other featuring local business memorabilia, are set to open to the public at the annual Appraiser Fair on Jan. 26, 2019. The fair takes place at the St. Clement’s Island Museum in Colton’s Point. Local artist Nicole Stewart’s work will be on featured in an exhibit titled Portrait of St. Mary’s. Ms. Stewart’s exhibit will give visitors a glimpse into the past and the present in St. Mary’s County. Many of the paintings are paired with a story about a person or place, or have information about an interesting site. The exhibit takes one on a journey with farms, boats, old homes and buildings, a horse and buggy, a local seafood house, people fishing, and to a museum that has an impressive collection of high-tech aeronautics. Ms. Stewart has won numerous awards; including the prestigious Gilham Award (twice) for best in show in portraiture at The Art League at the Torpedo Factory in Alexandria, VA. Her passion for portraiture is on display in her painting “Sharecroppers Daughter” and in other paintings of people in St. Mary’s County doing what they love to do. The second exhibit, “Businesses People Used and Loved in St. Mary’s County,” features business memorabilia from local collector Josh Guy. 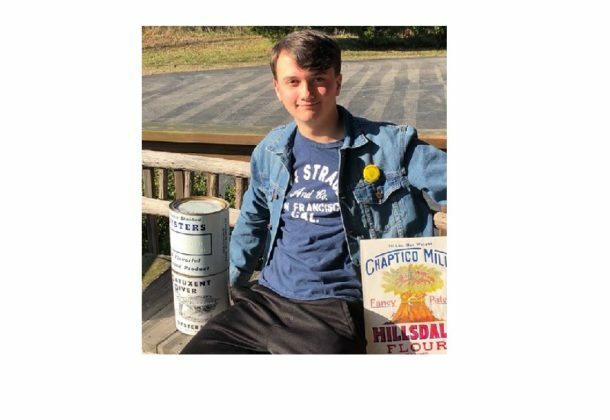 The Chopticon High School student from Helen began collecting when he was 13. He started with oil cans and signs and later took an interest in oyster cans. Everything he collects comes from a local business which once operated in St Mary’s County. Guy is excited his collection will be featured at the Appraiser Fair. “It’s important to remember these local businesses that people loved and used in their daily lives here in St. Mary’s County, and I hope my collection teaches others something about our local history,” Mr. Guy said. The Appraiser Fair occurs on Saturday, Jan. 26. The exhibits will be on display through Sunday, March 31, at the St. Clement’s Island Museum at 38370 Point Breeze Road in Colton’s Point. Call 301-769-2222 for details and hours of operation. If you are planning a visit to the museum, don’t miss Community Day on Feb. 8 and Maryland Day on March 25. For hours of operation, programs, admission prices and more, visit the St. Mary’s County Museum Division’s Facebook page here.